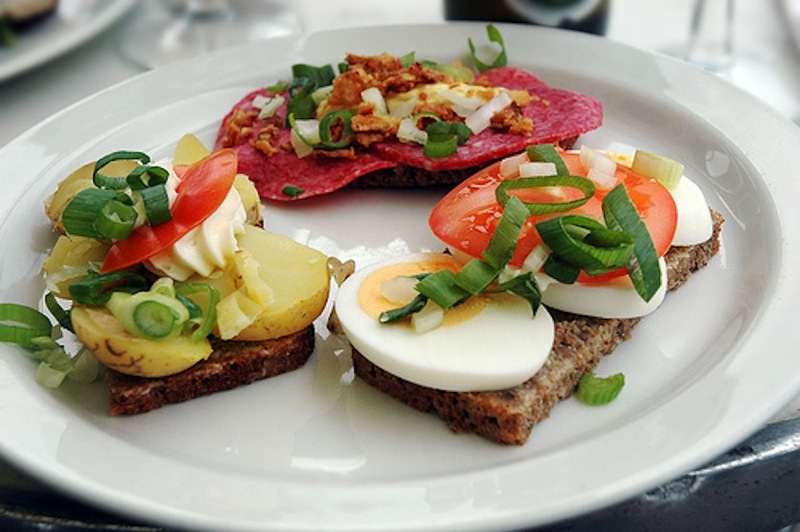 Many of my personal training clients in LA have told me they where frustrated with plain, boring diet food. Here are five quick, delicious, and fun meals to give you energy, muscle, and over all a better body. Spread 3/4 ounce cheese evenly over each bread slice; divide arugula, plum wedges, eggs, tomato, and prosciutto evenly over sandwiches. Drizzle each sandwich with about 1 tablespoon fig preserves mixture. Cut salmon into 4 equal servings . Season with salt and pepper. Spray a large non stick skillet with cooking spray and place over medium heat. Place salmon in skillet and cook for 4 minutes on each side until just cooked through. Remove to a plate to rest. In a bowl, combine cabbage, peppers, cucumbers, broccoli, carrots, and green onions. 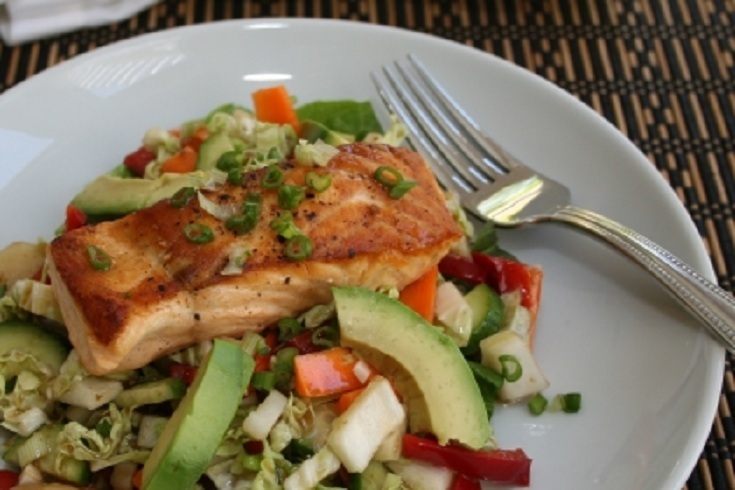 Divide cabbage mixture among plates, top with salmon, add desired dressing. Cook pasta in a large pot of boiling water until tender, 8 to 9 minutes. Drain, return to the pot and set aside. Meanwhile, warm the oil in a large skillet over medium heat. 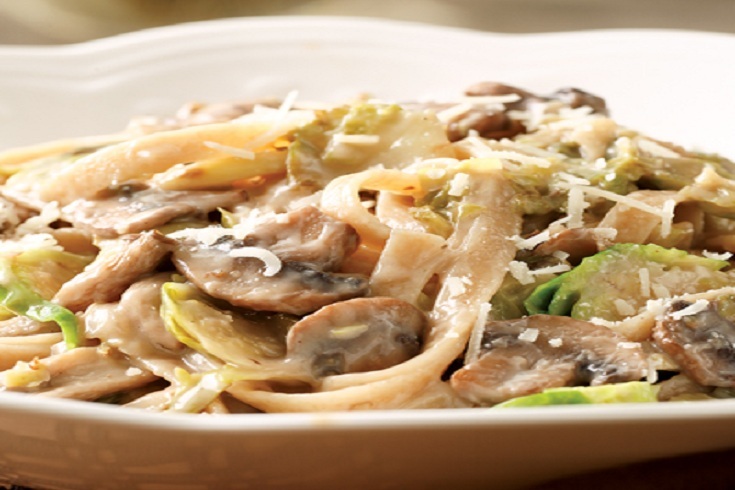 Put in mushrooms and Brussels sprouts and cook, stirring often, until the mushrooms release their liquid, 8 to 9 minutes. Add garlic and cook, stirring, about 1 minute. Add sherry (or vinegar), scraping up any brown bits; bring to a boil and cook, stirring, until almost evaporated, 10 seconds (if using vinegar) or about 1 minute (if using sherry). mix milk and flour in a bowl; add to the skillet with salt and pepper. Cook, stirring, until the sauce bubbles and thickens, about 2 minutes. Stir in Asiago until melted. Add the sauce to the pasta. Serve with more cheese, if desired. In a big bowl, mix together the peaches, chicken, cucumber and onion. In a blender, mix the vinegar, lemon juice, sugar, mint, salt and pepper. pour over chicken mixture. Cover and refrigerate until cold. 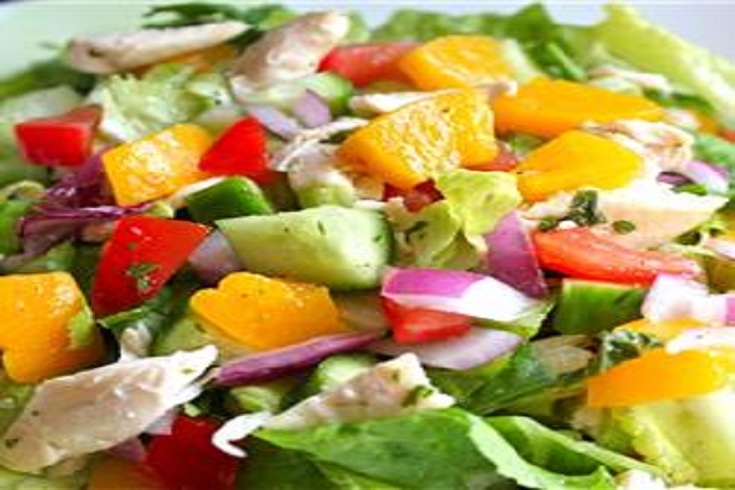 Serve on top of lettuce leaves. Heat a large nonstick skillet over medium-high heat. Spray pan with cooking spray. Add 2 garlic cloves; sauté 1 minute. Add 1/4 teaspoon salt, 1/8 teaspoon pepper, tomatoes, and spinach; sauté until moisture evaporates. Remove from heat; mix in cheeses and rind. 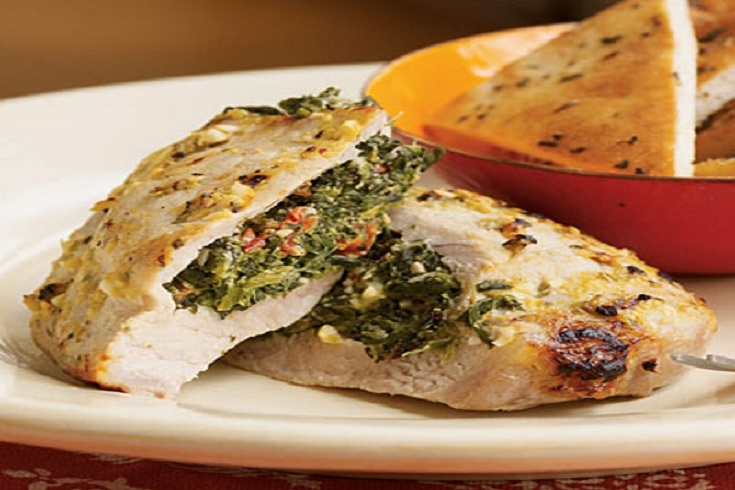 Cut a slit through thickest portion of each side pork chop to form a pocket. put about 1/4 cup spinach mixture into each pocket. put remaining 1/4 teaspoon salt and remaining 1/8 teaspoon pepper over pork evenly. Place pork on the rack of a broiler pan or roasting pan coated with cooking spray; place rack in pan. mix remaining 2 garlic cloves, juice, mustard, and oregano in a bowl; stir well. Brush half of mustard mixture over pork. Broil 6 minutes; flip pork. Brush remaining mixture over pork; broil 2 minutes or until done. « Don’t just change your body; change your life!